Step 1: Get involved in your school’s broadcasting program. Check! Step 2: Attend BCBC ’18. Register Today! Step 3: Participate in the Professional Development Track of sessions at BCBC ’18. You’re welcome! Resume & Cover Letter Workshop | 9:45-10:45 a.m.
What you decide to put on your website and in your resume matters. Learn to make the most of your first impression tools by discovering what potential employers are looking to learn about you from your resume and cover letter. Speed Networking| 11 a.m.-12 p.m. OR 1:30-2:30 p.m.
You have five minutes to ask the most important question of your career … GO! 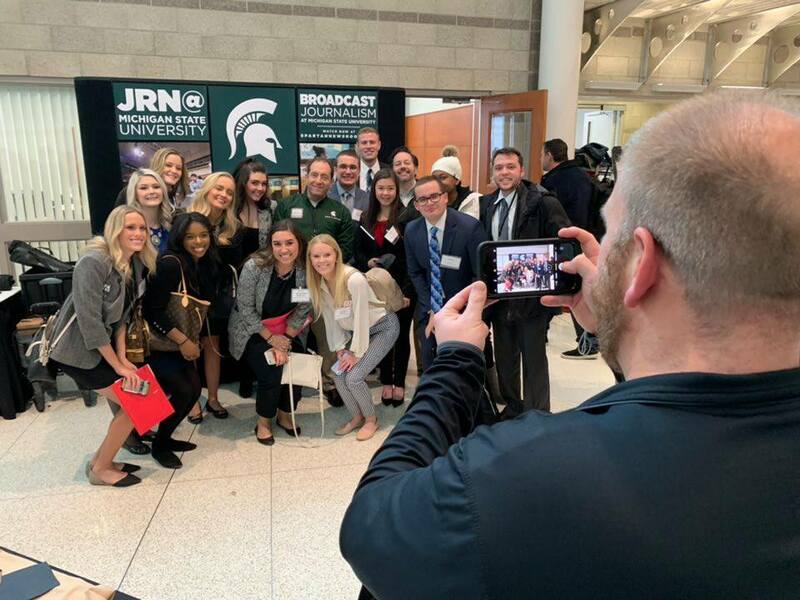 This popular session allows emerging professionals a unique opportunity to meet with Michigan broadcast professionals in a personal, one-on-one style setting. Come prepared with great questions and ready to make a good impression. Media Career Fair | 12-1:30 p.m.
Meet with over 20 broadcast and media companies hiring for jobs or internships. Bring several copies of your resume and dress to impress! Professional Head Shots | 12-1:30 p.m.
Get your picture taken by a professional photographer-trust us, you’ll need this. We’ll send you a link to download your touched up image after the event. Young Professional Round Tables | 1:30-2:30 p.m. Ever wonder how to break into the Broadcasting Industry? Now is your chance to sit down with recently graduated students in a small group setting. Pick their brain, find out what techniques were successful for them and learn skills from their experiences. 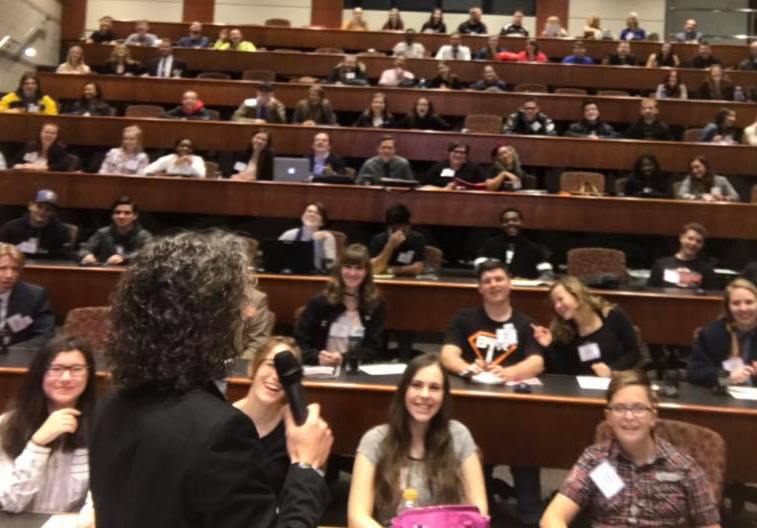 If you or your students are planning on attending BCBC ’17 , be sure to register before October 27 to receive the discounted registration rate of $20. After October 27, registration will be $35. NEW this year at BCBC, we’re offering a FREE head shots for students 18 and over! Students should make sure to register early to take advantage of this offering. Early registration is only $20 and includes lunch! Register for BCBC ’17 HERE and check out more at mybcbc.com. One of BCBC’s Favorites is Back Again! 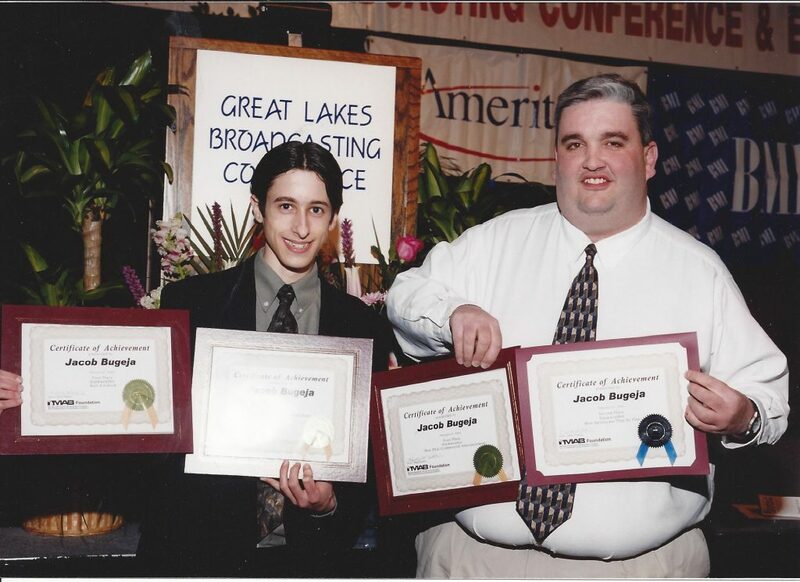 Michigan native Jay Kruz will be back at BCBC this year to impart his wisdom on our future broadcasters. 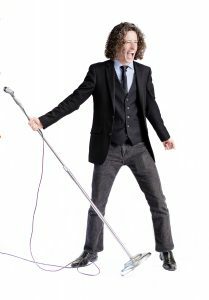 Kruz’s sessions are highly rated by students year after year-they love his approachable attitude, awesome hair and endless stream of industry knowledge. Named one of Radio’s Rising Stars by Radio Ink Magazine and one of broadcasting’s “30 Under 30 in America” by Edison Media, Jay Kruz is the Program Director and Afternoon Host at Mix 94.9 in Cincinnati. You don’t need someone to create opportunity for you… there are dozens of ways to do it yourself! Jay Kruz presents real life examples of media personalities and behind the scenes staff who didn’t wait for the chance to shine in “You Don’t Need Permission.” Hear the story of how a geek from Michigan became the lead animator for a major national video game. Find out how a well-known radio voice over artist found a path that others weren’t taking and created a lucrative career. From YouTube stars to internet radio creators, podcasters to producers – Jay will show you why You Don’t Need Permission from anyone to jump start your career. The Michigan Student Broadcast Awards deadline is coming up in December, do you know what your entry needs to win? Watch and listen to past winning entries and learn how to incorporate their winning features in your entries! Also get a review of this year’s categories and ask your questions about topic ideas and technical concerns. Fine-tuning your entries now will lead you down the path for success at the awards ceremony in March 2018! Jay is the perfect person to speak with students about the Student Broadcast Awards. 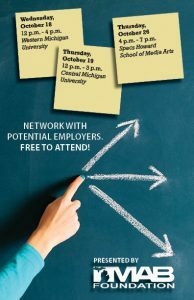 Make sure your students know about and plan to attend this important career building conference! Early registration is only $20 until October 27 and includes lunch! Register for BCBC 2017 HERE and check out the full event schedule at mybcbc.com. Are you interested in getting involved with BCBC? We’re looking for Speed Networkers! Contact Jacquelen Timm, [email protected], to learn more and sign up! When it comes time to apply for college or an internship, students need a resume. How can they ensure that they have developed the skills and experience needed to create a resume that will get them noticed? Luckily, the MAB Foundation is here to help! This year at BCBC, we’re offering a new session called “How to Get Involved and Build your Resume” for high school and college students that want to discover new ideas on how to get involved in the industry. Getting involved early-on will help them to build the skills they need to add to their resume when it’s time to hunt for a job or internship. Building skills to add to a resume can be challenging – let our group of young professionals help you out by giving you tips and advice on how to get involved! Learn about the endless opportunities you can easily pursue that will be great resume boosters and will help to get YOU noticed when it’s time to apply for college or an internship! Our professionals know exactly what to look for in a resume and will impart their wisdom on students. Don’t wait until graduation to get your resume or demo ready, the time to work on it is NOW! NEW this year, submit your resume or demo by October 27 for the opportunity to have it critiqued during the session (Limited Availability!). Names on resumes can be confidential if wanted. Email your resume or demo to [email protected] with the subject line “Resume/Demo Critique for BCBC” by October 27. Early registration is only $20 (includes lunch) until October 27! 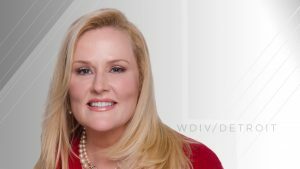 The MAB Foundation is excited to announce that Mara MacDonald, Reporter at WDIV-TV (Detroit), will address students as the Keynote Speaker at this year’s Broadcast Career Builder Conference (BCBC) on November 10. Mara’s experience as a reporter and her love of Michigan, combined with her ability to dig up the truth and hard hitting interview skills, make her the perfect person to address the future broadcasters that attend BCBC. BCBC ’17 is quickly approaching! The MAB Foundation is looking forward to meeting future broadcasters and educating students about our exciting field. This conference is definitely one of our favorites because it gets both students and current broadcasters involved in the learning experience. Early registration is only $20 until October 27! ($35 after October 27) and includes lunch! “Sitting in the WDIV lobby, waiting for my job interview, I was the most nervous I’d been in my entire life. I’d been considering a network job when the call came from Local 4. This was home. I was born here and grew up here and don’t let anyone tell you otherwise, coming home to work on the #1 station is exciting and nerve wracking at the same time. “When they inevitably asked why they should hire me, I gave them 2 reasons: my family is here and I’d rather be dipped in a vat of hot oil than embarrass them and what happens here matters to me, it’s not just another story. “I graduated from the Detroit Country Day School — Go Yellowjackets! And went on to get my degree in Diplomacy and Foreign Affairs from Miami University in Oxford, Ohio. I then started working my way up the ladder in TV with stops at WLNS in Lansing, WRIC in Richmond, Va., and WITI in Milwaukee, Wisc. I won a slew of awards along the way. Coming Soon: Fall Career Fairs! Attention Stations and Companies: Fall is right around the corner! Secure your booth TODAY at one of the MAB Foundation’s Fall 2017 Career & Networking Fairs. Meet with students and young professionals from across the state! October 18, from 12 to 4 p.m. at Western Michigan University’s Brown Hall. October 26, from 4 to 7 p.m. at Specs Howard School of Media Arts’s Southfield location.